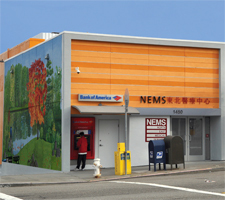 NEMS Health Clinic, 1450 Noriega Street, San Francisco — Transworld Construction, Inc.
Medical clinic remodel and new design layout of exam rooms, lab, pharmacy, staff offices and reception area. Refurbish included mechanical, electrical and plumbing services. In addition, rough carpentry, interior and exterior framing, new roof, paint, flooring, mill work including cabinets, handicap ramp and parking lot were constructed.